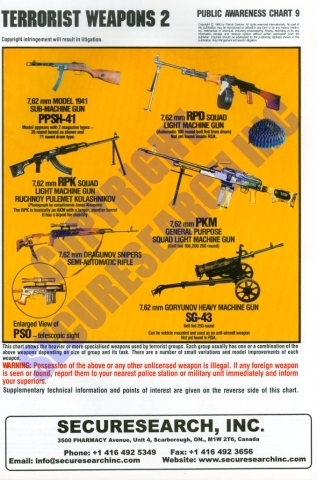 This is a poster of the heavier and more specialized weapons that have come into terrorist hands in some countries –such as Iraq, Afghanistan and a number of African and South American countries. Many of these weapons have been stolen from armed forces arsenals, or have been abandoned by retreating military forces, along with large supplies of ammunition. A lot of these heavy weapons were introduced to countries by the armed forces and sales representatives of the former Soviet Union. This is a poster of the heavier and more specialized weapons that have come into terrorist hands in some countries --such as Iraq, Afghanistan and a number of African and South American countries.